If I’ve said it once, I’ve said it a million time: TAKE TIME TO THINK! 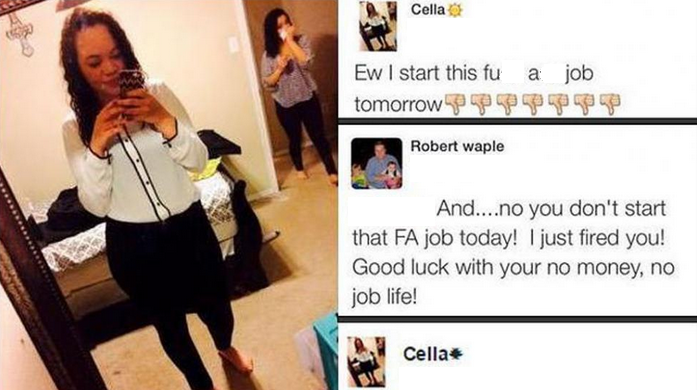 A young teen in Dallas, TX found herself out of a job before even starting after a tweet was spotted by her manager. The teenager in question, Cella, posted on her twitter account “Ew I start this f*** a** job tomorrow” with a series of thumbs down emoticons. It would seem that the firing over the social media site didn’t bother Cella who later posted, “I got fired over twitter” and has since been relishing in the “fame” cause by attention to the story. In the time since the incident took place Waple has cleared, not deleted, his account while Cella has been actively retweeting the praise and comments flooding her way. “who needs that f** a** job you’re famous,” commented one admirer. There is a lesson to be learned on both side of the table here when it comes to the misuse of Social Media. For Cella, while the “instant fame” may be endearing to her now, the backlash in the future may end up costing her future employment. With this story being broadcast over major new outlets, it puts her name and face everywhere in a very negative light. It’s important for young social media users to understand that incidents like this are “flash in the pan” fame that seem great at first but with no staying power, fades just as fast. The long term effects of her actions will end up costing her in the future. Waple cause himself some serious damage in this incident as well. For his own franchise he could potentially leave a sour taste in customer’s mouths who don’t appreciate his reaction to the situation. He also causes harm to his brand as its name is being dragged through the mud with this incident. The situation was poorly handled by both parties and should be a lesson in social media etiquette for all. I have seen my fair share of people, young and old, lose out on opportunities for education and employment opportunities for tweets, status updates and photos. Additionally I’ve seen people lose their credibility for the same. Take those few extra moments each time your online to think about what you’re about to post and how that one post can cost you more than you could ever imagine.